← Jane 2nd in new NE half marathon! Sunday 27th March saw my first fell race, and I decided to throw caution to the wind by starting with a biggy – 21 miles and 4000’+ of climbing. These numbers clearly instilled a good deal of respect in me, but I don’t think I truly understood the scale of the task until I drove through Mam Nick on the way there, and dropped down into the valley. You can then look around you and see the skyline you’re going to be running round, and it’s vast. Even though I felt I’d trained well enough and was looking forward to it, the sheer size of the valley still terrified me. After some deliberation about what to wear in the car park (field, obviously), I ended up listening to my very skinny fell-running mate and put on an extra layer and went for the long-sleeved base layer. This would prove to be my downfall later in the race as the weather warmed up. After sign-in and very thorough kit check it was time to go. The start of the race went pretty well for me, a trot then scramble up Ringing Roger, then a run along the tops to Crookstone Hill. The run down to Crookstone Barn saw me live up to expectations and take a tumble, but fortunately I chose a good place to fall. As one runner said, “at least he chose a soft place to land”, and his mate replied, “yeah, his head”. A quick forward roll later I was off again. Next came the climb of Win Hill, I chose the narrow path to the left and tucked in behind a lady who was running in the top 10 women at that point. I was relieved to hear her breathing as heavily as I was, so that gave me confidence that if she could make it to the top then so could I, and soon enough it came, though by that stage I was sweating heavily. Then came the descent of Win Hill. I would say this was probably my least favourite part of the race. The descent was way beyond my novice fell-running abilities and I was lucky not to be down again as I clipped my toes a couple of times on the way. I managed to catch up the the people who’d dropped me on the descent going through Hope to the bottom of Lose Hill. I cannot tell you how relieved I was when everyone else switched to a walk up this part. It surprised me how my heart, lungs and legs were still hurting when we switched to walking, but I was so glad I wasn’t expected to run at that point. I say everyone was walking up Lose Hill, but there was one madman who was still trying to run. “Hello Andy”, I said, as Mr Robinson rolled by. I managed to keep him in sight near the top of the hill (and managed to de-layer a bit on the way up) but the descent was a completely different matter as my legs were now starting to tire, and I was feeling cold in my wet clothes. As I got to Hollins Cross and Mam Tor the lactic from the climb of Lose Hill started to clear and I managed to keep running over the top of Mam Tor and through the half-way check at Mam Nick, where there was some very welcome homemade flapjack, which merited a stop for a couple of minutes. Then came Rushup Edge, which might not pose too many problems normally but was a bit of a slog by that stage. Then the race turned right and started off over the peat bog to Brown Knoll. This was where it all started to go wrong for me. I paid the penalty for the perspiration of the first half and the cramp arrived, first in my quads and then my calves. If there’s one place you don’t want cramp it’s a peat bog, when your muscles are having to work overtime to keep you upright anyway. The remainder of the race after that was a case of walking until the cramp faded, then running again until the cramp came back, and then repeating the cycle. This was pretty frustrating as I felt I could still be running well, but at least I could keep going, albeit slower, and at least the weather conditions were fair so I feel sure the bog could have been much, much worse. Eventually the bog ended, and I was actually glad to start climbing afterwards as it felt easier on my legs. The remaining four or five miles again were a case of running when I didn’t have cramp, but at least I could try and walk the uphill bits and run the flatter bits, and I didn’t seem to lose too many places. The noise of race numbers being shouted signalled that the final checkpoint of Ringing Roger was near, and you could start to relax knowing there was only the descent back to the finish. This was extremely tricky with crampy legs, but by then just getting down was a satisfactory result. The run across the grass to the finish was a truly great feeling, and I was smiling rather than grimacing as I crossed the line. My finish time of about 4 hours 9 minutes was better than I’d budgeted for. It could’ve been better without the over-layering and subsequent cramp, but I was just pleased just to have conquered it. On the stagger back to the car park I looked around at the skyline again – it still looked too big to consider running round, but somehow I can now say I have. The Dark Peak club put on an excellent race. There were enough Marshalls to mean I didn’t have to get my map out. Admittedly this was partly because I’d memorised the main parts, and partly because I’d decided that the map would only contain bad news, but the Marshalling was excellent. 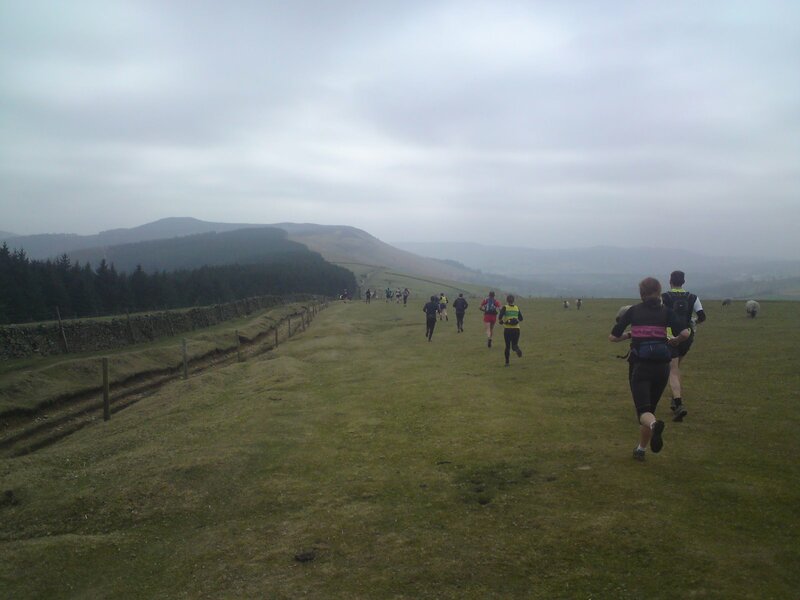 This entry was posted in Uncategorized and tagged edale skyline, fell run, race. Bookmark the permalink. Nice work Ed! You know shorter races are available right? There’s a list over on the right there (2011 fell series). Well done Andy and Ed!